The Adaptive Sensors Group (ASG), led by Prof. Dermot Diamond in the Insight Centre for Data Analytics/National Centre for Sensor Research, was visited on 28-30th of July by representatives from GE Global Research and UES as part of an on-going collaboration funded under the US based Nano-BIO Manufacturing Consortium (NBMC). The consortium includes a number of outstanding US partners, including GE Global Research, University of Connecticut, University of Massachusetts-Amherst, American Semiconductor Inc., University of Arizona, UES and the Air Force Research Laboratories, working together for the development of a Wearable Device for Dynamic Assessment of Hydration Status. As the only non-US partner, Dublin City University, and specifically the team led by Prof. Dermot Diamond, comprising Dr. Colm Delaney, Dr. Larisa Florea and Probal Bose, have played a very significant role in the progress of this important project. This work aims to explore the synergy between the Adaptive Sensors Group’s proven track-record in the development of ion-sensing and recent strides made by GE Global Research in developing a miniaturised device for extended hydration analysis. 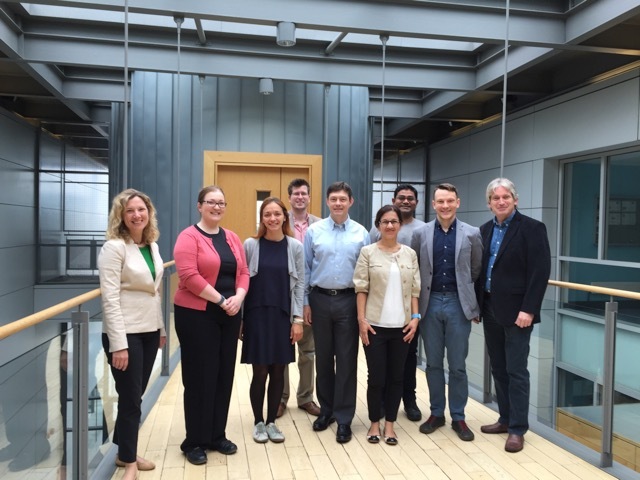 The visiting researchers were impressed by the highly integrated, multi-disciplinary team-based approach that facilitated close interactions across multiple projects within the INSIGHT Centre and the National Centre for Sensor Research. They also visited the National Research Facility to see the advanced equipment and discuss models for shared access. This highly successful visit could form the basis of further collaborative research activities between US partners including GE Global Research and the ASG team at the Insight Centre. Left to right: Melanie Tomczak (UES), Breda Kiernan (Insight Centre manager), Larisa Florea (Insight-ASG Team Leader Materials Chemistry), Simon Coleman, (Insight-ASG Team leader Materials Integration), Ralf Lenigk (GE Global Research), Azar Alizadeh (GE Global research), Probal Bose (NBMC Project Engineer), Colm Delaney (NBMC Project Postdoctoral Fellow), Dermot Diamond (Insight PI, ASG Group Leader). 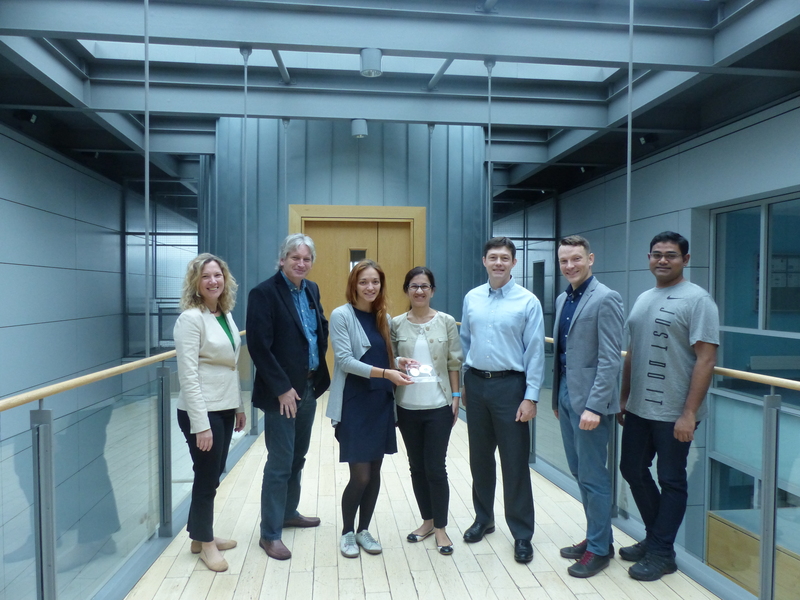 Left to right: Melanie Tomczak (UES), Dermot Diamond (Insight PI, ASG Group Leader), Larisa Florea (Insight-ASG Team Leader Materials Chemistry), Azar Alizadeh (GE Global research), Ralf Lenigk (GE Global Research), Colm Delaney (NBMC Project Postdoctoral Fellow), Probal Bose (NBMC Project Engineer).